The scars from the unrest in Baltimore only a few months ago are still being felt throughout the city. St. Peter Claver, in the heart of where most of the violence took place, is helping its community heal from within. Baltimore was thrust into the national spotlight following the death of Freddie Gray, a 25-year-old black man who died while in police custody. His death led to rioting and vandalism in parts of west Baltimore. While things have calmed down immensely, a degree of frustration still remains in the community. That is where the parish has come in to help. 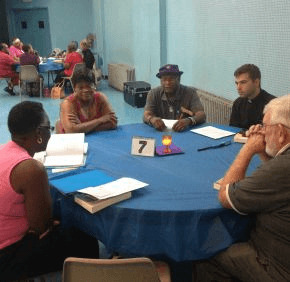 St. Peter Claver, located in the Sandtown-Winchester neighborhood where Gray lived, has begun a retreat program based on the teachings and spiritual exercises of St. Ignatius of Loyola. A 16-week experience, each retreat session lasts four weeks and is aimed at helping participants find inner peace and gain a closer relationship to God through prayer and meditation. The retreats are conducted in conjunction with the Jesuit Collaborative, a non-profit affiliated with the order that aims to help others grow closer to God through prayer and retreats in the tradition of St. Ignatius. Josephite Father Ray Bomberger, pastor of St. Peter Claver, said the retreats have averaged about 40 people a week, consisting of both parishioners and those in the community who have a desire to heal through their faith. At the Aug. 3 session, participants received handouts and heard readings. One spiritual exercise came in the form of a prayer, asking God to make them better listeners. They sang hymns throughout the session. All were invited to talk about what was going on in their lives and what they’ve gotten from the retreat. At one point they broke into smaller prayer groups of 10 people or so, discussing the exercises. Toni Moore-Duggan is the main facilitator of the retreats. Originally from the neighborhood, she said she felt the retreat was needed in light of everything that took place in the area, and that it has been beneficial to those in the community who have attended. Retired Baltimore City police Sgt. J.T. Moore, the brother of Moore-Duggan, has attended each of the sessions. He said they encouraged him to believe that better days are ahead for the community. The community members and parishioners, however, are not the only one who have gotten something out of the retreat. The retreats are held Monday evenings at St. Peter Claver, 6:30-8:30 p.m. The first retreat session concluded in August. The next four-week session will begin Sept. 14. For more information about the retreats, email Kevin O’Brien at kobrien@jesuitcollaborative.org.